Sayat Nova (aka The Color of Pomegranates): one of the most challenging movies I've seen in the entirety of my mission to see interesting movies, up there with Fata Morgana, Sans Soleil, and The Holy Mountain. 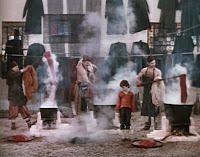 The composition and orientation of scenes, the choreography of action, and the rhythm of events all fly in the face of my accepted viewing habits, and in order to appreciate this ostensible masterpiece by maverick Soviet director Sergei Parajanov, I had to take a deep breath and fully buy into it. It took a lot of patience, and an effort to thoroughly relax my brain and accept my intuitive reactions without question. Aside from those instinctive, aesthetic, and subliminal reactions, there's not much to work from when trying to create meaning from Parajanov's disparate images. Commentators like talking about two things with The Color of Pomegranates: first, Parajanov's arrest and imprisonment in a Gulag for his Armenian nationalism; second, the subversive aesthetics of the film's images. For instance, you'll frequently hear the film referred to as "poetic," generally as a way to explain its non-narrative, often impenetrable treatment of its subject. 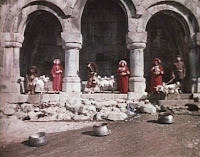 Second, because of his strange, motionless use of his camera, and his tendency to have all his actors address it directly, Parajanov's images are commonly referred to as "tableau," and critics make observations that he seems less like a filmmaker and more like a folk painter in motion. If you think of these in that light, then this whole film is sort of a tapestry of small stories, each represented in a static scene. 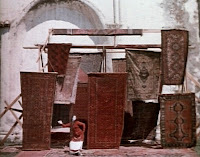 This is sort of fitting, considering Armenian woven carpets and religious tapestries are one of the foremost motifs in The Color of Pomegranates. The Color of Pomegranates is known for its effective use of color; indeed, this is what led me to it, here in the middle of Chromatic March. The film actually has a gestalt structure of color consciousness, I think... the background palette is arid and earth-toned, light brown and gray, the color of dry desert ground in oversaturated sunlight. This sets the dusty exterior tone for the whole film; indeed, even interior sequences seem to be infused with open air and penetrating sunlight. As we've read before, Technicolor required a lot of light to work right... but Parajanov's lighting is intense, a reminder that we're out in a bright, dry world, exposed to its elements. This desert palette provides the ground for the second palette in The Color of Pomegranates, which is basically black, white, and dark red, with a touch of pastel blue-green in one key sequence. This palette is used to separate objects from the background: the white of lace and a desert rose, the black of the monks' robes, and the crimson of pomegranates, rugs, dye, and animal blood. Of course, I can't give you a simple reading of these foreground objects that seem to take on such intense significance. In order to do that, I would have to construct correspondences for the whole movie, which is a massive agglomeration of such symbols, all of which seem to be speaking a foreign visual dialect. So, to return to an earlier point: is this visual dialect truly "poetic"? The descriptor comes up too often to ignore. Is there some similarity between the way a poem speaks in words, and Sayat Nova speaks in images? Well, from a quick survey of dictionary.com, I find that most of the definitions define poetry as written work using heightened language, and/or words chosen for their sound, and/or using certain formal devices, such as "meter, metaphor, and rhyme." It's fairly safe, I think, to say that poetry is expressive writing that prioritizes formal aspects over natural language use, and expression over communication. And in a sense, this does describe The Color of Pomegranates. Formally, it's a deeply experimental work, deconstructing the "language" of cinema and reinventing it in an eclectic painterly style. In terms of content, it eschews the traditional means of telling a story through recreation of a hypothetical reality... instead, it collects references and symbols and motifs, and it assembles them into a constellation of concepts gravitating around the character of Sayat Nova, accompanied by his muse, his parents, the monks of his monastery, and others who passed through his life. Before and during my viewings of this film, I glanced around the web for some guidance in watching it. I found very little... most of the sources merely expressed their appreciation, and repeated their first and second impressions of the film: it was poetic, emotional, subversive and meditative. It has great use of color. I'm a guy who needs to find some conceptual anchor points, especially in an obviously complex, highly semantic film like Sayat Nova, and these sources generally weren't helpful. So I'm going to try to take a step and give you a starting point for forming some interpretations of the elements in Sayat Nova. These are just tentative observations, but if you're about to watch this mysterious, beautiful film, they may at least give you an idea of what to look for. 1. The simplest thing to note: the film has a bit of chronology to it, and if you're clued in ahead of time, you won't have to work so hard to figure this part out. It's roughly divided into four periods: childhood, when the protagonist is played by a child; adolescence, when he is played by a young man; adulthood, when he is played by a tall man with a goatee; and late adulthood, when the same grown man appears, but with a streak of white. 3. Armenian culture is famous for, among other things, two textiles: carpets, and lace. The former figures prominently into the young life of our protagonist, and if we're to read the film's primary female figure as his muse, then the second is a motif associated with her. Wool and lace, love and desire -- these themes are constantly at the forefront of the film's imagery. 4. Note the use of white garments and face paint, which has a pretty clear representational role. 5. A bunch of other motifs that will be repeated, and that form the texture of Sayat Nova's symbolic vocabulary: the books, a golden shell, cherubs, water spilling from the earth, the flock of sheep (which, at one point, act as a congregation witnessing the death of a spiritual leader), a pair of fools, the troubadour's lyre, and skin turned red, either with dye or with blood. 6. Watch for three of the most beautiful moments in film: first, on a rooftop, surrounded by books drying in the sun; second, in the Land of the Dead, before a cadaver in a storm of ashes; third, toward the end, when the protagonist's voice is preserved in a clay vessel. You may not need to do any active interpretation of The Color of Pomegranates. Many (perhaps most) of its advocates love it purely for the visuals, and for the mystery and atmosphere of the experience. It's absolutely a beautiful film in this regard, and so if this is true of you, I applaud you. If you're not this type of person... if you need a semantic foothold before you can maintain interest in a film... then I hope my list above gives you what you need to enjoy it. It may be a masterpiece, but going out on a limb, I'd say it's definitely not for everybody. But if you've got an open mind and a curious, patient soul, I'd recommend giving it a look. I also find this very interesting. I found your link on AOL about films in teal and orange. I'm a commercial packaging designer and have always used red, black or yellow as my main colors for retail because its stands out so well and many years ago did a study color theory about this type of thing... Nice blog BTW. Thanks for the comment, Jeffrey. I'm a designer as well (interactive, in my case) and it's amazing how colors are a key part of everything I do professionally... at times I feel like I'm not aware enough, or calculated enough, about color decisions. Hopefully this month of blog posts helps exercise that sensibility a bit. You really provide some very interesting insight sir. While I very much liked Shadows of Forgotten Ancestors, Legend of Suram Fortress and Ashik Kerib, I could find no appreciation in this film heralded as his true masterpiece. And just like you, all I found on the web were big words thrown about, but nothing of real meaning as to WHY people really appreciated this film apart from the visuals. The still camera in fact bothered me and I could not find much beauty in its imagery either, despite being a fan of lots of other visually brilliant films. While, as you say it is not difficult to figure out the linear nature of the story and what happens on a broader context, it is the finer symbols that totally impenetrable and with lack of a proper narrative sans dialog, makes for a tedious watch. I had wondered what that final scene with the clay jar meant. You have thrown some good light on it!